State Route 74 (SR-74) Ortega Highway east La Pata/Antonio Parkway between post miles 5.50 and 5.53. The exceptionally heavy winter storm in January 2017 revealed a failed culvert drainage pipe and section of damaged embankment beneath State Route 74 (SR-74) in San Juan Capistrano that materialized as cracking in the roadway and a sudden dip in both lanes of the roadway required the full closure of the highway. SR-74, also known as the Ortega Highway, settled 4 inches in 24 hours and rapidly formed cracking indicated deep tension issues that compromised the stability of the road. The Ortega Highway, which has only one eastbound and one westbound lane, is one of only two highways connecting Orange County to neighboring Riverside County and carries more than 35,000 vehicles each day in each direction. Once the source of the issues had been determined, Caltrans District 12 staff immediately devised an innovative repair project that had the heavily-traveled highway reopened in three weeks; repairs that could have had the roadway closed for months. The culvert failure resulted in storm waters flowing around the pipe in the area below the road, causing subsurface cavities, thus undercutting and weakening the embankment and the paved areas above. 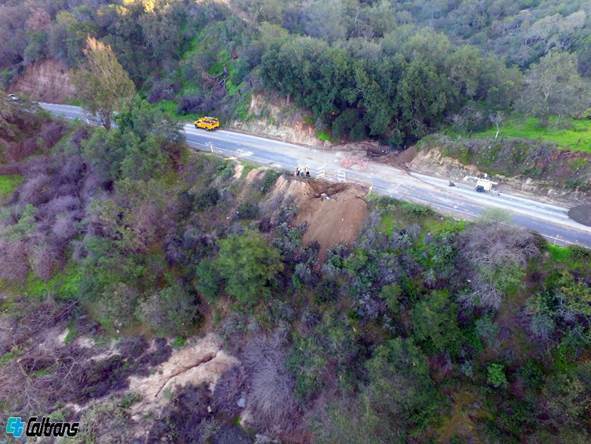 Further storm damaged caused erosion to the hillsides immediately adjacent to the roadway, creating a potential threat to motorists. To repair the roadway, Caltrans District 12 Maintenance Engineering partnered with Caltrans Headquarters to undertake a 24/7 operation to repair and reopen the roadway. Drilling and rapid analysis of the embankment failure showed the embankment material was unstable to a depth of 26.5 feet below the pavement. Removal of the full embankment was considered, but excavation to depths of almost 30 feet posed significant negative effects to the immediate environment, and required a shoring structure and earthwork operation that would delay re-opening of the roadway for months. Working in conjunction with industry representatives and an emergency contractor, Caltrans Geotechnical Engineers executed a two part repair: 1) fill the subsurface voids and improve the affected subsurface soils by compaction grouting, and 2) improving the shallow subsurface soils by excavation and reconstruction of the top 5-10 feet of the embankment, while also replacing the drainage culvert and damaged surface pavement. Following the heavy rainfall at the end of January 2017, State Route 74 (SR-74) experienced significant storm damage to the roadway, including stability issues. To ensure the safety of motorists, it was necessary to fully close the highway while the California Department of Transportation (Caltrans) District 12 undertook immediate emergency repairs. With around-the-clock work and a site-specific innovative repair, Caltrans was able to expediently open the newly strengthened and rebuilt roadway within three-weeks. Repairs to the roadway could have had the roadway closed for months, under conventional project development process. The Ortega Highway, which has only one eastbound and one westbound lane, is one of only two highways connecting Orange County to neighboring Riverside County and on average more than 35,000 vehicles travel each day in each direction. It is a principal east to west route traversing Interstate 5 east to the cities of San Juan Capistrano, Rancho Santa Margarita and Ladera Ranch. It reaches over the Santa Ana Mountains into Lake Elsinore Valley in western Riverside County. SR-74 serves as a commuter route, taking motorists directly between Interstate 15 in Lake Elsinore and Orange County using essentially the same route utilized over 100 years prior by Native Americans. Given the nature of the closure and the impact to commuters, the District 12 Public Information Office worked proactively to ensure public awareness on the status of the project. The team, working with Construction and Maintenance, provided frequent updates to the public using social media – Facebook and Twitter – and email outreach. A motorist first observed the quickly formed dip of the pavement of the eastbound lane. In response Caltrans assessed the roadway condition and observed that an approximately 60 to 70-foot long segment of the eastbound lane had settled – with a four-inch depression near the middle of the segment. Additionally, an approximately one-quarter to one-third inch thick crack was observed in the westbound lane. The crack originated about 30 feet east of the storm drain alignment, spreading eastwards approximately along the centerline of the roadway for a distance of about 40 feet. There was a slight vertical drop on the pavement (on the north side) along the crack. Determining the root cause of the issue required Caltrans to bring in specialized drilling equipment to conduct exploratory forensic work and better assess the extent and depth of the damage to the highway, District 12 Maintenance and Geotechnical Engineering staff performed an emergency drilling investigation, which revealed voids and soft, loose materials down to 30 feet indicating an unstable embankment. The asphalt pavement settlement and distress was also attributed to the failed 24-inch diameter culvert drainage pipe beneath the roadway. Using a truck mounted drill rig (Mobile B-48) and hollow-stem augers, a geotechnical investigation with drilling and sampling of bore holes was performed, which included seven holes drilled to depths ranging from 16.5 to 27 feet. The bore holes were located over the subject site area to identify the geographical extent of the affected subsurface area. Additional holes were drilled to investigate and confirm the presumed slope movement. The location of the damaged roadway – its narrowness, the slopes on either side, and being a major east-west connector route – presented a number of challenges that Caltrans needed to quickly overcome. Removing materials to depths of 25 feet or more given the limited space was not feasible. Such removals needed shoring and a significant area for excavations for construction operations such as approach ramps. Such large excavations would have required the removal of mature trees/vegetation at the site, raising environmental concerns. It was essential to find an alternate solution, which ultimately was compaction grouting. The repairs utilized compaction grouting to fill the voids and stabilize the affected subsurface soils. Additionally, following the completion of the grouting, improvements to the shallow subsurface soils were made by excavating the top 5 feet on the south side and the top 10 feet of the area adjacent to the downward slope. The excavation and soil replacement could be performed with minimal disruption to the surrounding environment, while replacing the roadway as expeditiously as possible. The grouting – done around-the-clock until completed – was performed with grout points on a 5-foot square grid. At a number of grout points, large quantities of grout needed to be injected, particularly at depths below 20 feet. Such large intakes of grout indicated the presence of significant cavities within the subsurface soils. Following grouting, the level of improvement was assessed through Cone Penetration Tests (CPT) performed at the centroids of the grids. A total of eight CPT tests were conducted at points spread geographically over the grouted area. The tests showed that the grouting was successful in filling the voids and improving the subsurface soils. Further, the structural pavement and the subsurface soils were overexcavated to predetermined depths. The overexcavations were backfilled with material in layers and compacted to a minimum of 90 percent relative compaction as determined through the ASTM D1157 test method. Photos will be sent subsequently. The heavy winter storms in Jan 2017 revealed a failing culvert pipe and section of failing embankment beneath SR-74 in San Juan Capistrano that materialized as cracking in the asphalt and a sudden dip in both lanes of the road requiring the closure. Ortega Highway settled 4 inches in 24 hours and rapid cracking indicated deep tension issues that could affect the stability of the road. The highway is one of 2 hwys connecting OC to Riverside Co. and more than 35,000 vehicles travel each day. The exceptionally heavy winter storm in January 2017 revealed a failed culvert drainage pipe and section of failing embankment beneath State Route 74 (SR-74) in San Juan Capistrano that materialized as cracking in the asphalt and a sudden dip in both lanes of the roadway requiring the full closure of the highway. SR-74, also known as the Ortega Highway, settled 4 inches in 24 hours and rapid cracking indicated deep tension issues that could affect the stability of the road. The Ortega Highway, which has only one eastbound and one westbound lane, is one of only two highways connecting Orange County to neighboring Riverside County and on average more than 35,000 vehicles travel each day in each direction. Once the source of the issues had been determined, Caltrans District 12 staff devised an innovative repair project that had the heavily-traveled highway reopened in three weeks; repairs that could have had the roadway closed for months. To repair the roadway, the Caltrans District 12 Maintenance Engineering partnered with Caltrans Headquarters to undertake a 24/7 operation to repair and reopen the roadway. Drilling and rapid analysis of the embankment failure showed the embankment material was unstable to a depth of 26.5 feet below the pavement.